In the past few weeks, I bought the wood pieces to start making the khana, which is the slat walls of the yurt. 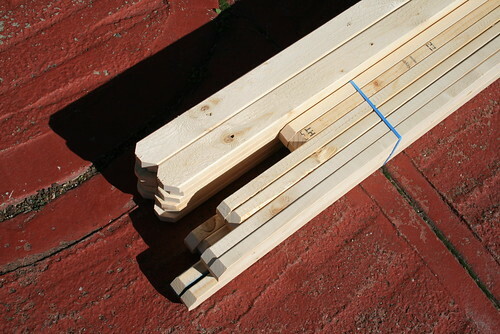 I went to Ashby Lumber in Berkeley, and bought 80 pieces of 8ft slats (they are 1x2 inch) made of douglas fir. I am following Paul King's guide, although I am not bending the khana pieces as he suggests in his book. I just don't have the time or the energy to make a steaming vessel to put all of the wood pieces inside and then bend them. The khana join together at points 9 inches apart to form a criss-crossed lattice style wall. For my 12 foot diameter yurt, I will need to make 3 sections of khana, which join together to create the wall. The wall wraps around and is forced into a circle. Once it is joined to a door frame (as you can see in the photo below) it creates a strong support for the roof poles. 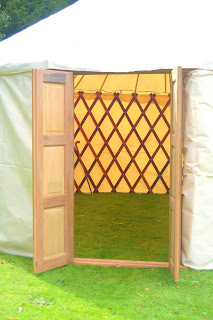 This is a picture of a yurt from allaboutyurts.com where you can see the lattice wall, or khana. I have a total of 85 pieces, the longest being 6.5 feet. This should make for a 5 foot wall height. It took me two weekends to cut down each of the 85 pieces to length, and also round off the two ends so that there weren't any sharp corners. Then I had to drill holes every 9 inches. There were soooo many holes to drill that it literally took half the entire time. I first made a template piece, which had three holes drilled every 9 inches. I put that on top of the piece of khana I was drilling to mark where to make each hole. When I marked the three from the template, I moved the template down the piece until I reached the end, as Paul King suggests in his book. Some of the khana pieces I made our of douglas fir. The ends were cut at an angle so that there were no sharp points. I am now in the process of sanding all of the pieces (all 85 of them!) and then varnishing them with one coat. I got over half of them sanded already and about 1/5th of the pieces varnished. The varnish will seal the wood and make it look nicer from inside. I am basically done with the frame of the yurt. Now I just have to put it together after I finish varnishing all of the pieces, including the roof poles. Bristlecone Pines: Earth's Oldest Living Things!